Our experience ranges from simple separations to complex multi-stage applications involving filtration, clarification, extraction, cake washing, and drying. 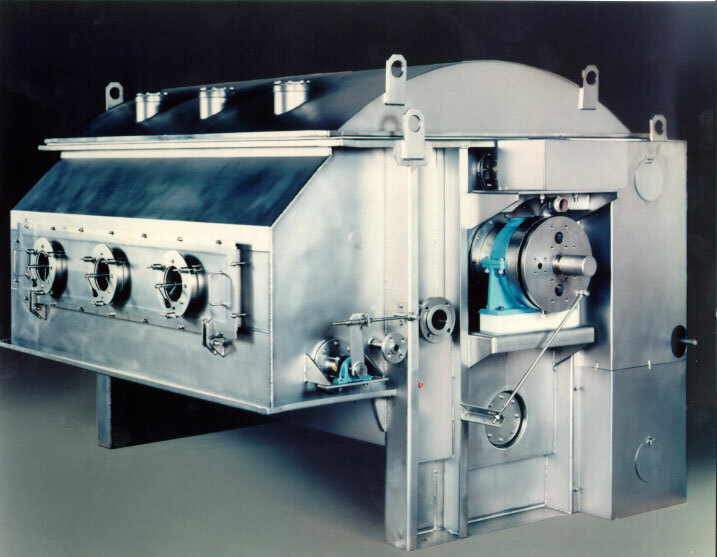 The Komline-Sanderson Rotary Drum Vacuum Filter is applied to process and waste slurries for filtering, clarifying, cake washing and extraction, and dewatering. Industries served by K-S include inorganic and organic chemicals, pharmaceuticals and biotech, plastics, food products, minerals, electric power and other utilities. Specific process applications are referenced in the Design Section. The process of the RDVF is continuous. 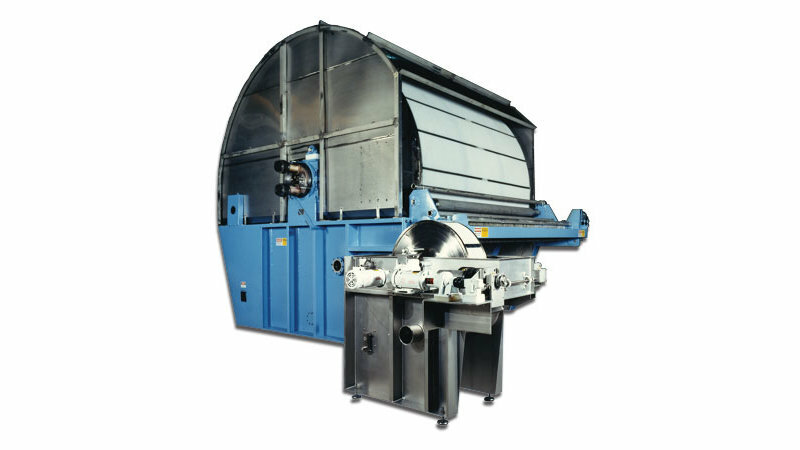 Each revolution of the drum consists of cake formation, cake washing (if needed), dewatering or drying, and cake discharge. As the drum rotates, it is partially submerged in the feed slurry. 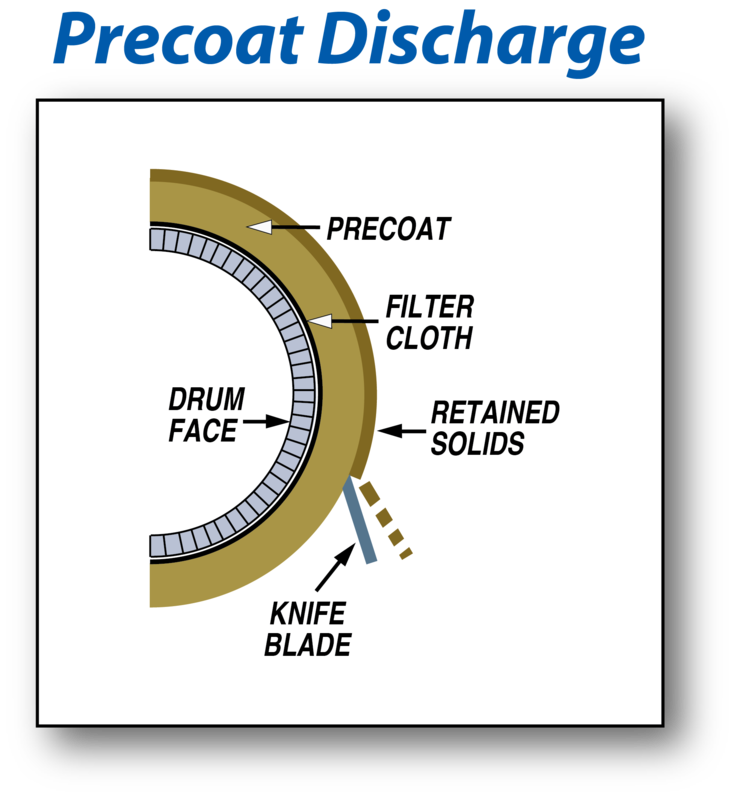 Vacuum draws liquid through the filter medium (cloth) on the drum surface which retains the solids. Vacuum is applied using a liquid ring vacuum pump or other means. 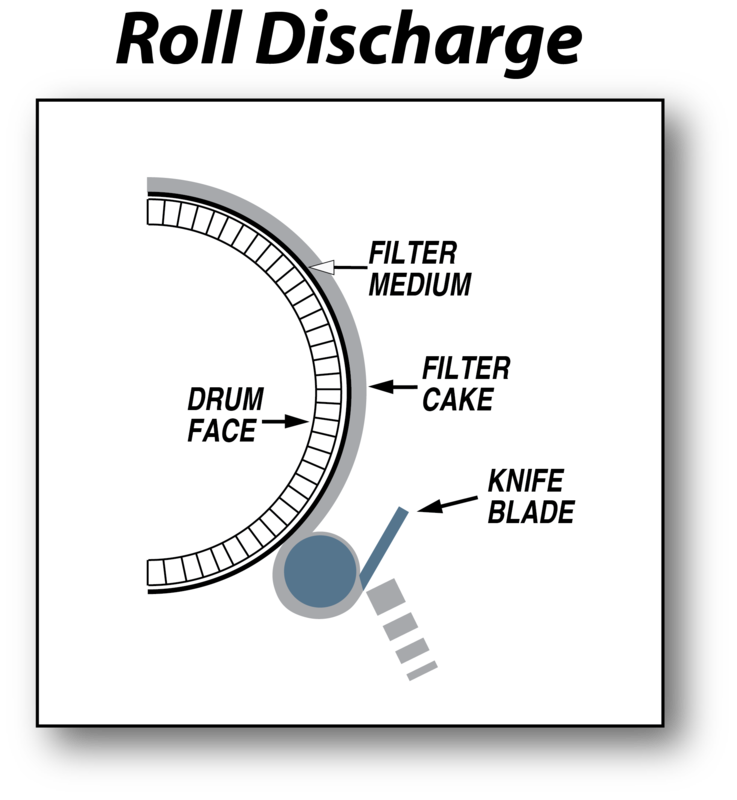 The vacuum pulls air (or gas) through the cake and continues to remove moisture as the drum rotates. The filtrate and air pulled through the medium flow through internal filtrate pipes and pass though the rotary valve and into the filtrate receiver. The liquid stream is separated from the vapor stream in the receiver. If required, the cake can be washed to remove impurities or to extract more product. Additional drying of the cake follows washing. How do I know if an RDVF is right for my process? 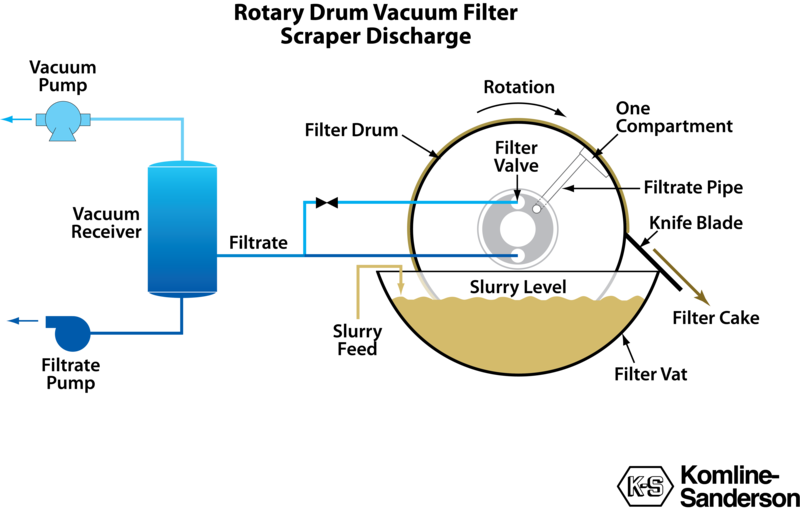 If your process involves any of the following, then the Komline-Sanderson Rotary Drum Vacuum Filter may fit your needs. Our equipment requires minimal operator attention as well as low maintenance time and expense, and is designed and built for long equipment life. There are many factors affecting the operation of a filtration process. Among these are the need for chemical pretreatment; the need for precoat or filter aid; power, water, air, or other utilities; operator attention; cleaning requirements; and maintenance needs. All of these should be considered when selecting a filter. 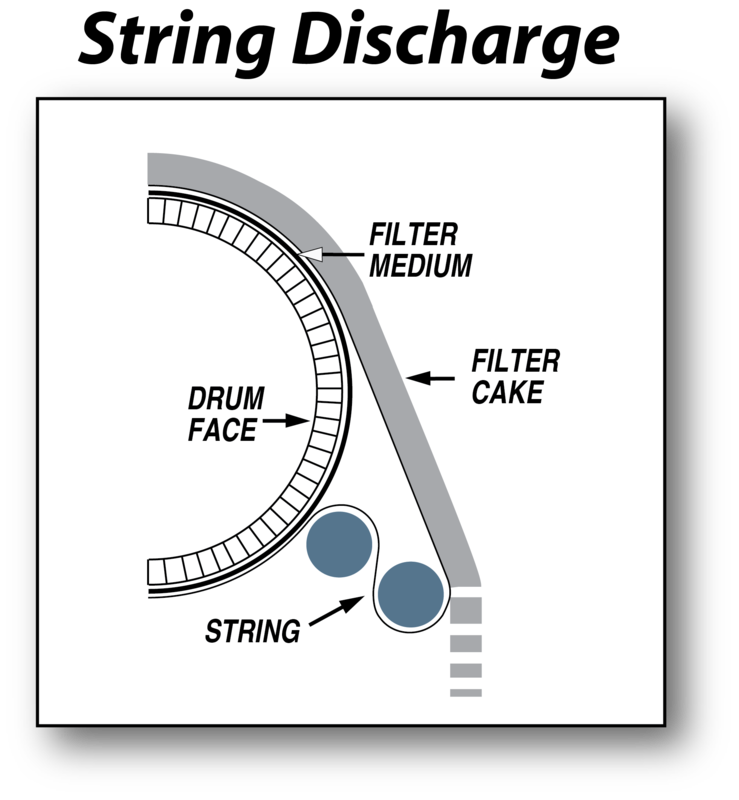 The rotary vacuum filter discharges its filter cake using one of several arrangements. 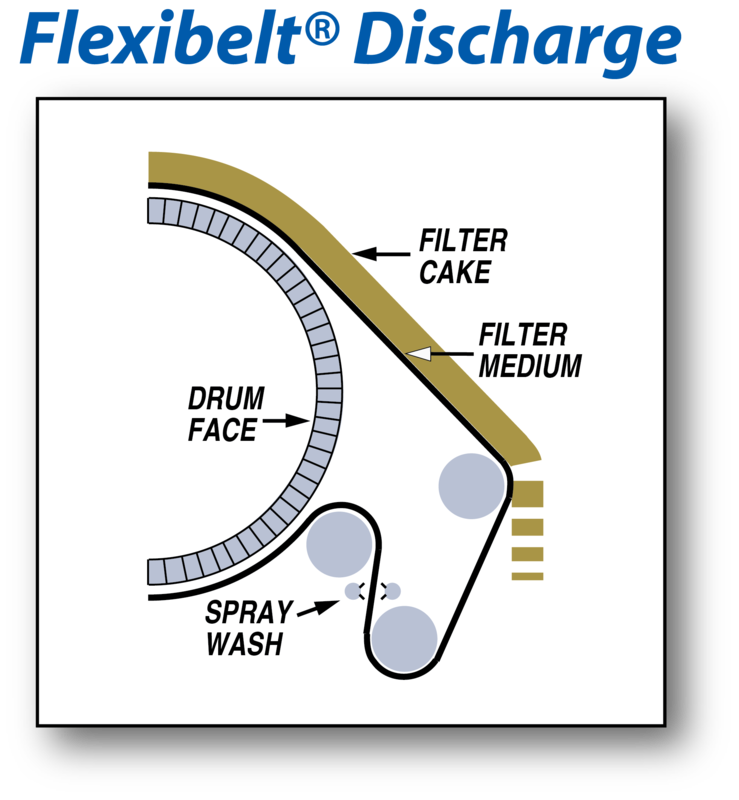 A discharge mechanism is selected based on the process material characteristics and on how readily it releases from the filter media. Where filter medium washing is required to prevent blinding. For the discharge of thin cakes. For dry cake discharge or sluice (wet) cake discharge. For slimy, sticky, oily and blinding solids. 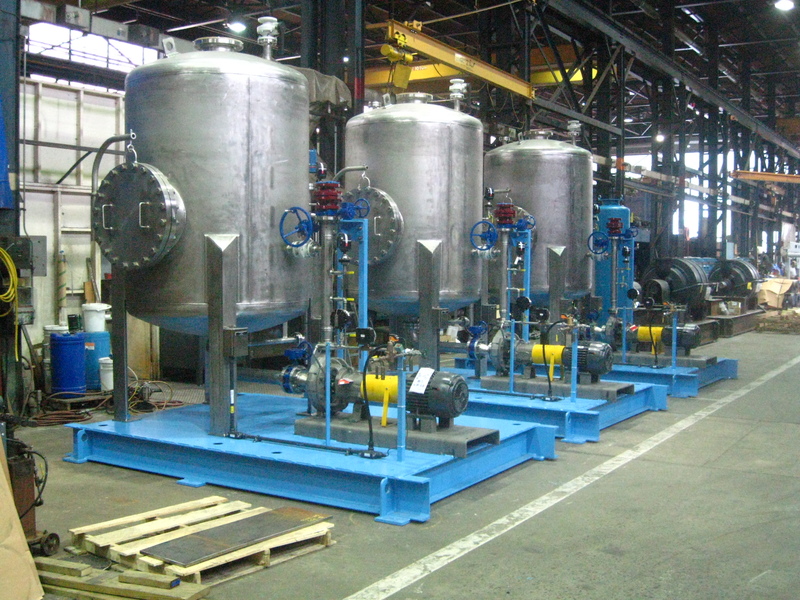 For filtering dilute slurries with varying feed concentrations. For the discharge of very thin filter cakes. For filtering/dewatering granular or crystalline solids. 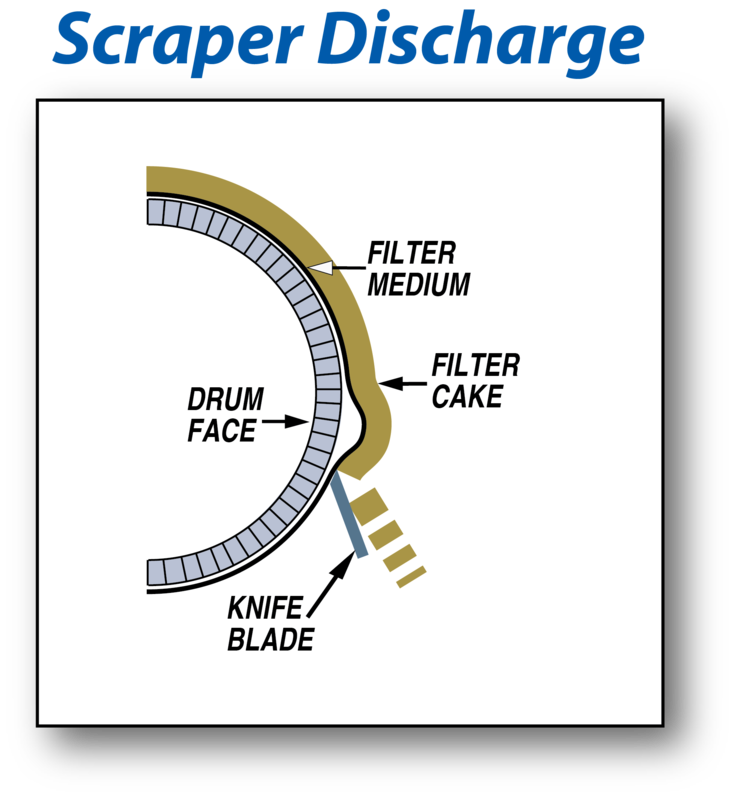 For discharging cakes in excess of 1/4″ thick. For non-blinding cakes where cloth washing is not required. For discharging dilatent and thixotropic materials. For applications with very small particle sizes. K-S process and project engineers provide assistance at all phases of the project. 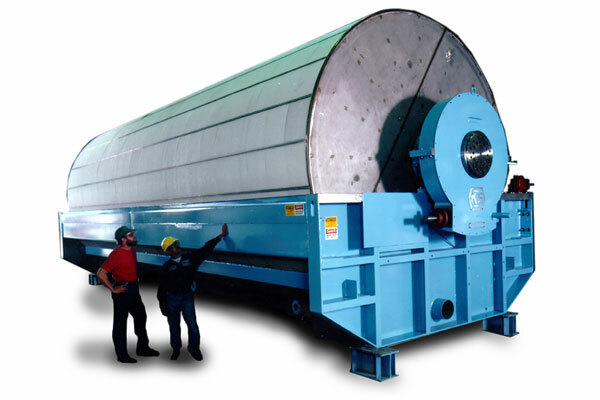 Depending on your specific requirements, K-S can provide you with a Rotary Drum Filter or a complete system. A successful plant depends on the integration of the key process units with properly selected ancillary equipment and the right facility design. Reliability, ease of operation, rugged construction, performance, and superior customer service are all trademarks of a K-S installation. A typical system includes a vacuum pump, filtrate pump, and vacuum/filtrate receiver. Also required in some cases are feed or drain pumps and precoat or chemical prep tanks with mixers. Often these items are mounted, wired and piped on a common base for ease of installation. Depending on customer needs, cake-handling equipment can also be provided. Controls and instrumentation are available to complete the system. 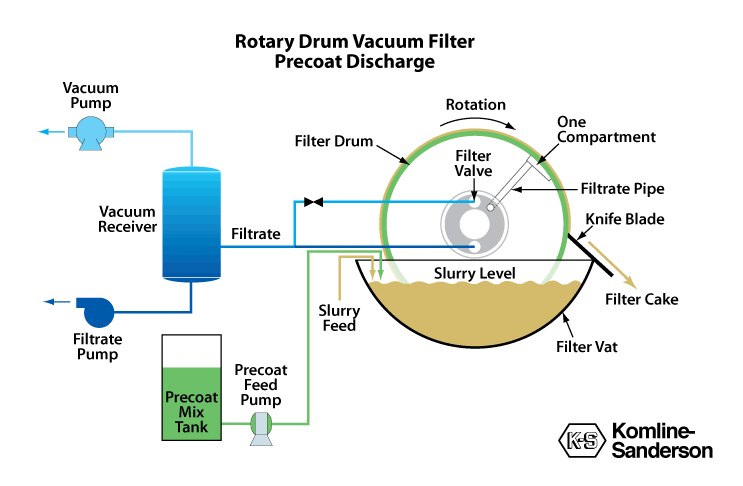 The rotary drum vacuum filter is a very versatile liquid/solid separation device. It is used where a continuous separation of a solid from a liquid stream is desired. It can be used in process applications where the solid is the product or where the liquid is the product (and sometimes when both phases are the product). In wastewater applications it can be used to dewater a variety of sludges or to clarify wastewater. Is there an easy test to tell if an RDVF is right for an application? A simple Buchner funnel test will generally determine if the use of an RDVF is feasible. Further testing using a test leaf can be done to simulate the operation of the RDVF under specific operating conditions. Can an RDVF be used in a batch process? Cake washing is used when a given cake purity is required. It is also used to improve extraction of liquid products or dissolved materials from the filter cake. Lab or pilot testing can be used to determine the effectiveness and efficiency of cake washing on an RDVF. How is the correct size and style of cake discharge determined? Lab testing is often the best way to determine the correct filtration characteristics of a given material. In many cases, an RDVF has been previously installed or tested for the same or a similar application. This provides a good starting point in selecting equipment. The design of the RDVF can be changed to suit specific needs for a given application. Various types of cake discharge mechanisms are used depending on the characteristics of the filter cake. Our equipment can be constructed of a variety of materials including carbon steel, stainless steel, plastic, Hastelloy, or titanium. Special material finishes for food or pharmaceutical applications can also be specified. Designs are available for applications requiring vapor containment. Vapor-retaining hoods can be used much like the hood in a lab. Completely sealed, vapor-tight designs are used where absolutely no leakage is permitted. Generally items required are: vacuum pump(s), filtrate pump(s), and vacuum/filtrate receiver. Also required in some cases are feed or drain pumps and precoat or chemical prep tanks with mixers. Depending on customer needs, cake handling equipment can also be provided. Auxiliary equipment can be provided by K-Sfor a complete system including controls and instrumentation. Electric power is required to run the filter drives as well as the vacuum pump and the filtrate pump. Water is needed as seal liquid for the vacuum pump and also for cloth wash and sometimes cake wash depending on the application. The RDVF is essentially a hands-off machine that requires very little operator attention. Also, it runs at a very slow speed (typically between 0.25 to 1.0 rpm). This means that it will generally operate trouble free with very little maintenance. Maintenance usually involves lubrication of drives and bearings and occasional changing of filter cloth and replacement of wear items. It is difficult to give a specific cost since there are many sizes and designs of RDVFs, however, spare parts costs are generally low on a yearly basis. Replacement filter cloth is the most common spare part. Other items requiring yearly maintenance include certain wear items on the filter valve and the cake discharge assembly. RDVF pilot units are available for rental. The filters have 316SS wetted parts and can be fitted with a cake discharge assembly suited to the application.